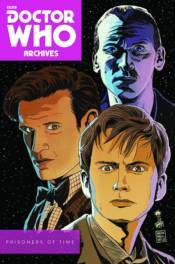 Celebrate the fiftieth-anniversary of Doctor Who anew with an epic adventure featuring the Doctor's first eleven incarnations! Writers Scott & David Tipton are joined by some of the greatest artists of the Doctor's comic book past and present to tell a story that shakes the Doctor to his core! Collects Doctor Who: Prisoners of Time #1-12.